Chelsea Clinton and long time boyfriend Marc Mezvinsky are tying the knot this weekend in an undisclosed location with highly guarded details. It was speculated for the last few weeks that Barack Obama may be attending the event based on reports that his Secret Service was seen making arrangements for his attendance. It turns out President Obama will not attend Chelsea Clinton’s wedding, announced today by Press Secretary Robert Gibbs. It is not clear yet if President Obama was invited but this marks the first time it has been publicly announced that he will not be attending. 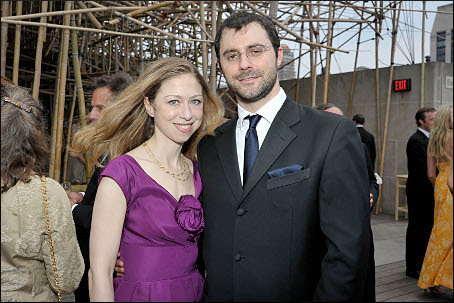 Clinton, 30 years old, will marry Marc Mezvinsky, 32 years old, in a location not even announced to their guests. Yes, not even the guests of the wedding know where it will take place. The Clinton’s informed guests of their hotel accommodations just recently. Prior to their announcement, they took the attendees credit card numbers and book their hotel for them. Transportation will take the guests to the secret wedding location. Speculation says the wedding will take place at Astor Courts, an estate of John Jacob Astor IV, but it has not yet been factually confirmed. The guests were also informed of what to wear – black tie affair. It will be interesting to see photos from the highly guarded wedding after this weekend’s festivities. Congratulations to Chelsea on her upcoming wedding. Although President Obama will most likely not be able to attend the wedding, this should not dampen this happy moment. Spending that much on a wedding truly baffles me – and where they earned that sort of money even more so. I simply hope they will live happily ever after, because a divorce after a wedding of this size will undoubtedly not make Chelsea’s parents very happy!